The Rettner Hall Fabrication Studio is located in room 104 and provides about 1,600 sq. ft. of reconfigurable workspace for projects ranging from construction assembly to bench electronics to mobile robotics and more. Lab benches provide open access to some electronics gear, with more to come. Half the space has a two-story ceiling for projects needing vertical space. 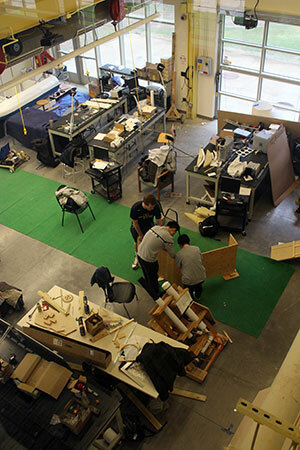 The Fabrication Studio is the home of the UR Makers group. The Fabrication Studio is currently open 24/7/365 via card swipe. Please note that there is video surveillance of the space at all times. Instructors wanting to use the space for courses are asked to contact the Rettner Hall Director to make arrangements in advance. See the calendar (ical or html) for availability.